MINI Cooper Acccessories + MINI Cooper Parts :: OutMotoring.com MINI Blog :: MINI Lifestyle :: Tired of singing in the rain? Synopsis: We've got you covered with the MINI umbrella! If you love MINI's and want to have a little something to carry with you to flaunt your style in the rain, this is for you. 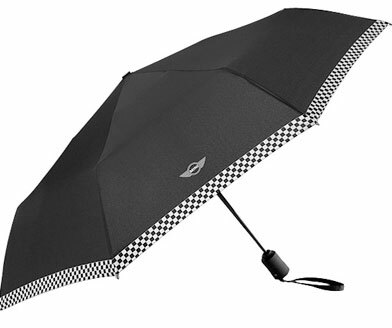 Designed for motoring on foot, this super-size umbrella has a checkered boarder around the edge and an auto-open feature. Includes storage bag as well. Storage size is about 12" in length- perfect for easy storage in your MINI door pocket, glove box or back seat. Comments on Tired of singing in the rain?